Living cells neatly package a big jumble of DNA, over two meters in length, into tidy, tiny chromosomes while preparing for cell division. Scientists have puzzled for decades over how this works. Researchers from Delft University and EMBL have finally managed to isolate and film the process, and witnessed – in real time – how a single protein complex called condensin reels in DNA to extrude a loop. By extruding many such loops in long strands of DNA, the cell packs its genome so it can be distributed evenly between its two daughter cells. The scientists published their findings online in Science on 22 February. This major discovery finally resolves a question that has been discussed in biology for over a century: how does the cell organise its spaghetti jumble of DNA into neat chromosomes in order be able to distribute its DNA evenly between two daughter cells? For many years, it has been clear that a protein complex called ‘condensin’ plays a key role, but until now, biologists were divided on exactly how condensin functioned. 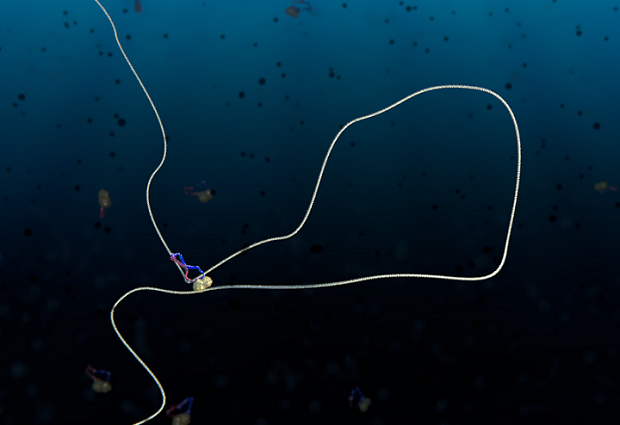 One theory stated that condensin works like a hook that can grasp and connect DNA within the jumble of DNA, thus tying it together. Another theory suggested that the ring-shaped condensin pulls the DNA inwards to create a loop. Scientists from the Cees Dekker group at the Kavli Institute of Delft University, together with scientists from the group of Christian Haering at EMBL Heidelberg who established the purification and fluorescence labelling of the protein, have now managed to catch the condensin complex in the act of extruding a loop of DNA. Artist impression of how a condensin protein complex extrudes a loop of DNA for the spatial organisation of chromosomes. The research represents a significant step in the fundamental understanding of DNA in our cells, but it is also relevant to medical research. Problems with the protein family to which condensin belongs—the SMC proteins—are related to hereditary conditions such as Cornelia de Lange Syndrome. As condensin is crucial in the organisation of the chromosomes during cell division, errors in the process can result in cancer. A better understanding of these fundamental processes is vital for tracking down the molecular origins of serious illnesses.